5 nights' accommodation in 4* hotels and 2 nights in 3* hotels. 7 breakfasts, 1 restaurant lunch, 4 dinners. A single, timed group transfer on arrival at Split and departure at Dubrovnik. Entrance fees for Krka & Mljet National Parks. A qualified local trekking guide throughout. All excursions and applicable entry fees as described in the itinerary. Wander the idyllic islands of the Dalmatian Coast, visit Krka National Park and explore the magnificent historic cities of Split and Dubrovnik. Easy walking, good food and wine, beautiful beaches and historic cities – these are a few of my favourite things, and this holiday delivered them in spades! Croatia surpassed my expectations on every level, with Dubrovnik the icing on the cake - one of those rare destinations which fully justify the hype. Travelling by foot and ferry, and staying in comfortable well-located 3 and 4 star hotels along the way, you explore one of the most beautiful coastlines in Europe where hundreds of sun-soaked islands rise from crystal clear seas. The region is steeped in history, yet Croatia has a cool, contemporary vibe with enchanting historic seaside towns now infused with bohemian bars, independent boutiques and a good dash of café culture. Your adventure starts on the mainland in atmospheric Split, Croatia’s second largest city with its Roman ruins, café culture and spectacular mountain backdrop. From here you explore the impressive limestone scenery and cascading waterfalls of Krka National Park and take a boat ride through its commanding canyon. A scenic passenger ferry ride takes you to your first Dalmatian island – rustic Brač. Here you walk to an abandoned monastery in a hidden valley, and then across the island to the highest point, 778m/2,552ft, of all 1,185 Croatian islands. Brač is renowned for its delicious olive oil which has been produced here for thousands of years, and you will have the chance try the oil and learn about the traditional production process. Then it is onto glamorous, golden Hvar with its Gothic architecture and marble streets that literally glow at sunset. Beyond the main town is an island of pine forest, olive groves, lavender fields and vineyards which you explore on a walk from the interior out along glorious coastline, stopping to swim in the incredibly clear turquoise water. Another ferry brings you to your third island and the magnificent medieval town of Korčula. The stout town walls and herring-bone maze of streets and alleys make this a mini-Dubrovnik. Unlike the bigger city though, Korčula Old Town still feels very much lived in. And no stay on Korčula is complete without sampling the crisp, white, award-winning wine made from the island’s Posip grapes. Your final island is delightfully sleepy Mljet. Over one third of the island has been designated as a national park, where there are two beautiful salt water lakes, both wonderful for swimming. You will take a boat out on the larger lake to visit a 14th century monastery on a tiny island and hike around the two lakes taking in several summits with far-reaching views. The holiday comes to a fitting finale in fairytale Dubrovnik with a final walk around the historic streets of the Old Town. Meal arrangements: 7 breakfasts, 1 lunch, 4 dinners. Lunches are not included on this trip but your guide will assist you each day in purchasing a picnic lunch. The small supermarkets in each town supply an excellent range of fresh bread, savoury snacks, pastries, fruit, vegetable and local cheese and meat specialities. Arrive Split. Group transfer to hotel. Walk in Krka National Park and boat ride through the canyon. Return to Split. Ferry to Brač, walk to Pustinja Blanca monastery and the summit of Vidova Gora 778m/2,552ft. Olive oil tasting and museum visit. Ferry to Hvar Island. Visit fort and coastal walk from Velo Grablje. Ferry to Korčula. Explore old town. Transfer inland and walk the Marmont Trail and back down to town. Evening wine tasting. Ferry to Mljet. Day walk in the National Park and boat to Sveti Marija. Ferry to Dubrovnik. Farewell lunch and walking tour of old town. Time at leisure. Group transfer to Dubrovnik Airport. Fly to London. Your guide will speak good English, have guiding qualifications and in our experience, will guide you with great patience and charm. Ilija Miloš is one of our leaders for this trip. 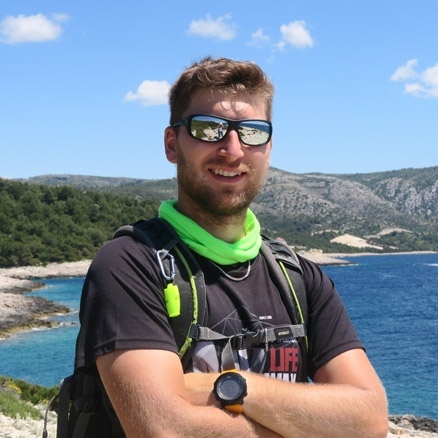 Ilija is an experienced guide, certified by the Croatian Mountain Rescue organisation to lead walking, trekking and cycling trips. He is great company and enjoys sharing his extensive knowledge of all things Croatian, especially history which he studied at university. When he’s not working as a guide Ilija enjoys travelling, sea-kayaking, playing competitive football and rowing for his local clubs. Day 1 - Fly London to Split. On arrival at Split airport there will be a single group transfer to your hotel. This is timed to fit the Mountain Kingdoms group flight, please check with us for further information. Your guide will meet you late afternoon for a brief orientation meeting followed by a welcome dinner together. Split is Croatia's second largest city; here contemporary architecture sits alongside UNESCO palaces, old city walls and a beautiful palm-lined waterside promenade (the Riva), all set beneath a spectacular mountain backdrop. At the UNESCO protected heart of Split is the Diocletian’s Palace. This living museum, built for the Emperor Diocletian, is undoubtedly the grandest Roman ruin in Europe and a wonderful place to wander and explore. Your hotel for the next two nights is actually set within the walls of the palace complex so you couldn’t be closer to the centre of the action. After regrouping in the evening you’ll head out to one of the many fantastic restaurants that fill this town. Day 2 - Transfer to Krka National Park - 1½ hours. Boat trip to Visovac Island. Walk to Roški Slap through Krka Canyon -4-5 hours. Return to Split. An early start this morning as you transfer to Lozovac, the entrance to Krka National Park. Created by a karst river and rightly described as the most picturesque valley in Croatia, this stunningly beautiful national park can only be described as a limestone phenomenon. A series of travertine waterfalls are the main attraction and you start by walking the wooden walkways around the most popular, Skradinski Buk. A 45 minute boat ride upstream leaves most of the crowds behind and brings you to the small island of Visovac with its monastery, church and museum. There are plenty of places to enjoy your picnic on the island with beautiful lake views. Crossing Lake Visovac back onto the mainland you start the 9km walk to Roški Slap. Relatively few people hike this well maintained route; when we researched this trip the only things we met along the trail were lots of lizards and a wild tortoise sunning itself on the footpath! The trail starts alongside the lake, and passes an interesting national park visitor centre (well worth a visit if it is open) before climbing up the side of the gorge for spectacular views down to the brilliant turquoise Krka River below. Information panels can be found along the trail along with shaded benches, especially welcome on a hot day. Eventually you descend from the plateau, the final stages on raised wooden boardwalks to protect the flora and fauna, before arriving at Roški Slap. The best views of these waterfalls are from the lakeside viewing platform on the lake front, and from here you can then do a boardwalk circuit among the cascades, known locally as the 'necklaces'. Total walking approximately 12km with 320m/1,050ft ascent/descent. In the late afternoon you return to Split. If you still have the energy we recommend the walk up above town to Marjan for wonderful sunset views back down over the city and the mountains behind. Day 3 - Ferry to Brač -1 hour. Walk to Blaca Hermitage - 30 minutes. Continue to the summit of Vidova Gora - 3–4 hours. Olive oil tasting in Skrip. It's an early start this morning as you walk through town to the port to catch the passenger ferry to your first island. Brac - pronounced "Bratch" - is the largest island in Dalmatia and, away from the popular resort towns of Bol and Supertar, is quiet and authentic. The mountainous interior is lined with piles of limestone, a throw-back to when vine and olive terraces covered the island. Each terrace was carved out of the stony ground by hand in order to provide cultivable land. Sadly in the early 19th century many vineyards were abandoned, in part due to disease, and then as the younger generation realised that there were less back-breaking ways to earn a living. Brav's claim to fame is that the first-class limestone from the island was quarried to build the White House in Washington. A short road transfer takes you the starting point for your walk at the top of the Pustinja Blanca valley. You descend for around half an hour into the steep-sided ravine with views ahead down to the sea beyond the mouth of the valley. The path levels off and you arrive at the UNESCO-listed abandoned Blaca Hermitage, tucked away in total seclusion and today only tended part-time by two brothers (and their donkeys). The monastery was built on the site of a hermits cave, and was a working monastery, with its own farm and observatory, for over 400 years. The hermitage is usually closed on Mondays but the exterior and magical setting is the real highlight. Your walk continues, traversing above the southern coastline and then up into the tranquil wooded interior of the island, gradually ascending towards the summit of Vidova Gora, 778m/2,552ft. Although maintained as an official walking route this path can be overgrown in places as only a handful of visitors come this way, most preferring to sun themselves on the beaches far below. The summit of Vidova Gora can also be accessed by road (your transport will be waiting here for you) and is marked with a giant cross and telecoms tower, however the views from the karst ridgeline are superb. On a clear day you can expect to see all the South-Dalmatian islands, the mainland and as far as Italy, and look down on the dramatic golden sandscape of Zlatni Rat. Total walking approximately 13km with around 600m/1,968ft of ascent & 200m/656ft descent. A short road transfer from the summit will take you on to the wonderful little olive oil museum in the picturesque village of Škrip. Here you can learn about the centuries' old production process and taste a more modern vintage! A final transfer takes you to your hotel for the night in the small port town of Milna on the northwest of the island. Day 4 - Ferry to Hvar - 30 minutes. Walk from Veliko Grabje to Hvar - 3-4 hours. Another day, another island… and what an island! This morning it is onto glamorous Hvar with its beautifully restored historic buildings, chic shops and excellent restaurants. Beyond the town there are secluded emerald coves, white pebble beaches and groves of wild lavender, rosemary and olive trees to explore. The morning ferry takes you to Hvar town. After a quick stop to buy your picnic lunch, probably from one of the excellent bakeries, you head up the stone steps through the old town to Fortica Španjola, the 16th century hilltop fortress which dominates the bay. After exploring the fort, you have a short road transfer into the interior of the island to the small village of Veliko Grabje where you start today's walk. You descend toward Malo Grablje, an abandoned stone village which dates back to the 9th century, and is built in traditional Croatian style. There is a short unavoidable section on a rarely used tarmac road before you continue on small footpaths following the dazzling coastline back round towards Hvar. You'll stop for your picnic lunch in one of the many beautiful bays en route and there will be a chance to take a swim from the beach at either Mekicevica or Pokonji Dol. Finally the walk concludes under the fragrant shade of dwarf Aleppo pines and past desirable seafront properties back into the delights of Hvar harbour. Total walking distance approximately 12km with negligible ascent and 360m/1,181ft descent. If you prefer to stay and relax on the beach at Mekicevica or Pokonji Dol, the walk back round the headland and into Hvar is easy and simple to find. Hvar's strategic location in the Adriatic has made the island an important trade base over the centuries. The Venetians in particular played a crucial part in the development of the town from the 1400s, building churches, monasteries and palaces whilst the Venetian fleet overwintered in Hvar's sheltered harbour. Their influence can still be seen everywhere. The remainder of the day is at leisure for you to explore the town, maybe visit the small museum and stroll the harbour promenade lined with the elegant yachts of the rich and famous. Alternatively you may like to take a taxi-boat across to one of the tiny islets opposite the harbour. Day 5 - Ferry to Korčula - 70 minutes. Walk the Marmot Trail from Pupnat and back down to Korčula town - 3-4 hours. There are great views of the old town as you arrive into Korcula on the ferry this morning. After disembarking you will head inside the imposing town walls to explore its historic highlights. Medieval Korcula is often known as 'Little Dubrovnik' and similarly is squeezed onto a peninsula. Narrow lanes lined with Gothic-renaissance architectural jewels are protected by fortified golden stone walls. Korcula claims to be the birth place of explorer Marco Polo and has a strong history of boat-building, marine-crafts and fishing. In addition to tourism the island has retained its sea-faring traditions, giving it a more down to earth feel than Hvar. Many of the valleys in the mountainous interior are fertile and used to grow fruit, vegetables and olives. After exploring the old town you take a short road transfer into the interior where a patchwork of olive fields and vineyards are punctuated by dark-green cypress spears and interspersed with swathes of Holm Oak and evergreen maquis. You start your walk along the old Marmot Trail from the small village of Pupnat, eventually turning off on a small overgrown footpath to Kocje, where karst formations sit half-hidden in what feels like enchanted woodland. From Kocje you walk past the small Brdo church to the hamlet of Prvo selo. There is a small café and supermarket here if you are in need of refreshment otherwise you continue your descent through cypress trees towards the sea with great views across to the peak of Sveti Ilija on the mainland. It is necessary to walk along the edge of a road for a short while before turning off past a church and cemetery and down on a shady path through Gradski Park into the outskirts of Korcula. Total walking distance approximately 12km, negligible ascent, 350m/1,140ft descent. The afternoon is free for you to relax or explore. You may like to enjoy the swimming pool at your hotel, swim from one of the small beaches, or alternatively head across the water to the small island of Badija where the perimeter makes for a pleasant hour-long walk. Korcula is well known for its crisp white wines, especially Posip and Grk which have been traditionally produced for centuries, and later this afternoon your guide will take you wine-tasting so you can sample them for yourself. There are numerous restaurants to choose from in Korcula; the simpler eateries outside the old town offer better value, but for excellent atmospheric dinning head to the southern side of the town walls where the waterfront is lined with al-fresco bistros and traditional live music is often performed in the evenings. Day 6 - Ferry to Mljet - 30 minutes. Explore island on foot and by boat. 5-6 hours walking. Today you move onto your final island - lush Mljet, which is scarcely populated and completely different in character to the other islands you have visited. Over one-third of Mljet is protected as national park, and the landscape here is heavily forested with Holm oak, tall stands of Aleppo pine and dense evergreen maquis. Legend has it that Odysseus chose secluded Mljet to hide away for seven years with the nymph Calypso, and it is easy to understand why. Mljet receives relatively few visitors, and most don't venture far beyond the shoreline of the two salt water lakes. You arrive into sleepy Pomena and after entering the national park your walk starts on the smaller of the two lakes, following a small footpath alongside the cool turquoise water. The path is lined with flowers and this is a favourite spot for some of the many butterfly species found in the park. Reaching the second and larger of the two saltwater lakes, Veliko Jezzero, you hop aboard a small boat to the visit the 12th Century monastery on the islet of Sv Marija. This is a pleasant spot for your picnic lunch. The boat takes you back across the lake to Pristaniste where you continue your walk up away from the main trail to the small peaks of Veliki Sladin and Montokuc for far-reaching views over the lakes and beyond. You complete the circuit of Veliko Jezzero, returning to Malo Jezero along the lakeside for a swim in the brilliant blue water before checking into your hotel in Pomena. Total walking approximately 15km, with around 280m/900ft of ascent and descent. Day 7 - Ferry to Dubrovnik - 80 minutes. Transfer to hotel. Farewell lunch. Walking tour of Dubrovnik Old Town - 2 hours. Rest of day at leisure. There is a final ferry south this morning, this time back to the mainland. On arrival you transfer to your hotel and orientate yourself before your guide escorts you on a short local bus ride to the Old Town. Your guide will also show you how to get the return bus back to the hotel so that you have the flexibility to return at any time. You arrive outside the city walls at the impressive Pile City Gate, and as you pass through the daunting 6m thick ramparts it feels like stepping into another world. Dubrovnik's spectacular limestone thoroughfare, the Stradum, stretches out in front of you beyond the Onofrio's Fountain, the gleaming street lined with baroque stone buildings on either side. After a group farewell lunch you will join an official walking tour around the streets of Dubrovnik old town. The Old Town of Dubrovnik (UNESCO), surrounded by ramparts and fortresses, is a treasure of architectural and cultural masterpieces, almost all well preserved over the centuries. Your walking tour will be led by a city guide who will introduce you to some of the Old Town highlights; the Franciscan Church and Monastery, the cathedral with its treasury housing the relics of St. Blaise, St. Blaise's Church, and of course the City Walls. The remainder of the day is free for you to explore further and are free to wander at leisure - you may like to walk the city walls, visit the Rector's Palace, take the cable car above the city to the Napoleonic fortress on Mt Srd, or make the steep climb up to the Lovrijenac Fortress. Your guide will arrange a time late afternoon to meet for the return bus journey or you may prefer to linger in the Old Town into the evening. Sunset over the red roofs of the city is unforgettable. Day 8 - Group transfer to Dubrovnik Airport. Fly to London. After breakfast there will be a group transfer to the airport. We can organise separate transfers to fit other flight departure times or alternate airports, and are also happy quote for extra nights in Dubrovnik if you are looking to extend you time in Croatia. Please contact the office for further information and hotel/transfer prices.